Sustainability is a powerful way to generate innovation at Danone, producing creativity through presenting new problems to solve, establishing big goals that force people to think differently and fostering contradictions. Employees are then empowered to act, thus generating innovation. Sustainability and innovation drive each other and together they increase competitiveness. The first thing that needs to be said to understand Danone’s corporate culture, is that it is a company that since its conception had a very clear social commitment, driven by the personal vision and values of the first CEO, Antoine Ribaud. Today Antoine son’s Franck Ribaud is the current CEO. As far back as 1972 Antoine Ribaud was talking about what he called “The Danone Double Project”, which in a nutshell was a firm understanding that Danone could not establish a business plan without simultaneously thinking of a broader idea of how Danone wanted to contribute to the world. Franck Ribaud’s famous words “we can not grow in the desert” meant the company needs a thriving society if it wants to be sustainable. These fundamental ideas that are at the base of the corporate culture, and which are shared by the organization, are the building blocks over which the rest of the business model is built. Today, the CEO maintains that "Our future depends on our ability to explore and invent new business models and new types of businesses. 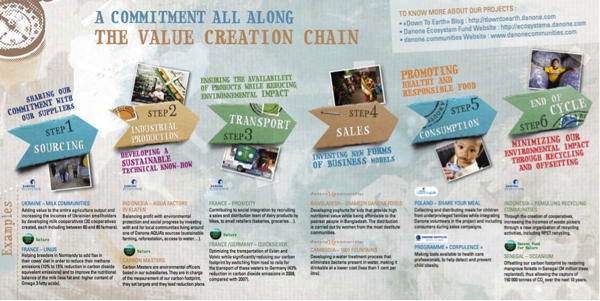 My vision for Danone: a business that creates economic value by creating social value". This corporate culture explains why in order to be true to the company mission of “generating health”, over the last years the Group Danone has re-shaped its assets selling profitable companies that manufactured beer and cookies, acquiring baby and medical nutrition companies, or focusing a large part of their R&D effort on health product development. This important change has allowed the Group to re-think its strategy strengthening even more the position of sustainability as a central part of its business model and value proposition. Today Danone focuses its growth in five key areas: People, Health, Innovation, Danone for All, and Nature. Danone’s sustainability strategy is based on three pillars: the Environmental Platform, the Social Platform and the Economic Platform. A big part of Danone’s organizational strategy is to decentralize, understanding that they need to manage operations differently according to contextual differences, and therefore that different units, offices and subsidiaries need to be able to develop distinct and unique solution based on social, cultural and economic differences. Furthermore, another big part of the organizational culture is the idea of empowering people to not only make decisions, but to be responsible for any activities they manage, even when these are not the result of their own decisions (in other words, if you accept to carry out someone else’s decision, you are accepting it as your own). In this context, the sustainability strategy is no different, where the corporation establishes some general guidelines and goals, but each country business unit develops its own way of implementing these ideas into specific strategies, policies and actions. In regards to the general corporate guidelines and objectives, the Environmental Platform is developed through five strategic priorities, and is mainly measured by CO2 footprint. The Social Platform focuses on policies mainly for employees and local communities, or what the organization refers to as “Danoners”, “Danone Supporting Life”, and “Danone Ecosystems”. The measurement of the Social Platform is based on different aspects of social impact, although measured through what is called “the labor footprint”, which focuses on managing responsibly the positive and negative impact Danone has on all people whose job is directly affected by Danone, regardless of whether they have a direct contractual agreement with Danone or not. The Economic Platform focuses on tangible issues such as financial performance or intangible ones, e.g., reputation management. One clear example of how these issues are managed would be the reduction in CO2 emissions. Danone Group established that emissions needed to be reduced by 30% by 2012, but did not say how. Then for example Danone Spain, worked as a pilot unit (in line with the concept of Lab, to be explained later) to develop a series of policies geared toward reducing CO2, such as changing transportation systems, improving packaging, or reducing energy consumption. Next, Danone Spain measured their results, and reported back to head office, and the head office aggregated the results from the different units to calculate the overall achievement. Integrating social, environmental and economic aspects into a value proposition is something that has always been present in Danone’s business model. Initially Danone yogurt was a health product sold in pharmacies, and that reflected the business philosophy of the founders and established the corporate DNA. However, as it grew in size and reach, Danone inadvertently started to somewhat dilute these central ideas, and little by little started to become just another food multinational, diversifying into different product segments such as cookies, sweets, cereals, sauces, meet, cheese, beers and soft drinks among others. However, Danone management begun to feel that the company had lost its focus as it no longer had a clear vision and mission of the type of company it wanted to be and particularly how it wanted to contribute to the world. The trigger for change was the perception that there were a combination of factors, both internal and external, generating a negative impact on the company. Internally there was the clear perception that Danone had lost focus, and that seemed to be affecting employee engagement and organizational culture. Externally the reputation of Danone seemed to have drifted away from a unique company specialized in some very specific products, becoming another multinational looking for opportunities to enter any possible field with only a profit motive. This prompted a deep reflection process to reconnect with the initial Danone spirit. Danone’s quest to reconnect with its original mission was built on two central ideas of health and growth. Danone had originally been a healthy food products company that wanted to have a double project: social and economic. Since the company was successful it had been growing, but that growth had apparently taken on a life of its own. Hence, the company decided that it wanted to grow, but not at any price. It wanted to maintain a clear vision and mission around this central theme of “health and growth”. Furthermore, Danone recognized that one of the central challenges the world will be facing in the future is nutrition from all points of view: sustainability, eating habits, changing demographics, epidemics, and so forth. Therefore, refocusing on “health and growth” not only made sense from the perspective of reconnecting to Danone’s corporate culture, but also in terms of seizing an opportunity in the market, as being the leading company providing healthy and yet delicious food products. That is partly why since 2000 until 2007 Danone sold most of the divisions deemed as not being part of this “healthy strategy” such as beer brands (2000), meet and cheese (2002), cereals and biscuits (2004 and 2007), and sauces (2005 and 2006). Simultaneously, Danone expanded and improved operations in its two remaining strategic divisions (dairy products and water) and at the same time entered new markets of baby foods (by acquiring Numico on 2007) and also medical nutrition. In fact the strategic shift was so deep than in 2007 Danone went from being the number two producer in the world of cereals and biscuits to being second worldwide in baby nutrition, through the sale of Lu to Kraft and purchasing Numico. At the same time, Danone started an internal reflection process around the central question of “What is the Danone we want for the next 10 years?” The end of this strategic reflection process was a decision to refocus the company in four central areas: (1) innovation, (2) people, (3) nature and (4) Danone for All. In operating terms this meant undergoing actual deep reorganizational changes, many of which directed at pursuing a central strategy of maintaining growth through innovation but only as a healthy food company. In other words, the core value proposition was for Danone to go back to its origins and become a company with a clear mission to produce healthy and sustainable products through innovation. This, in turn, translated into reconnecting with some of the original values that had shaped company culture. The new (and old) central values needed to be integrated into the current culture, which meant translating these values into concepts that made sense to the internal community, the Danoners. To achieve that, Danone developed policies to embed and integrate the corporate values throughout the organization. One good example of such policies was a program called Phoenix, created by Human Relations (that is what Human Resources are called at Danone) at the headquarters, involving senior managers at a global level to discuss and design how the new values would be embedded and “cascaded” throughout the organization. The program included different activities, such as workshops where a debate was created around the set of values that needed to be developed and how these were linked to the future of the company. Then these debates translated into specific practices, such as the type of changes implementing these new values would entail in terms of hiring practices, job descriptions, employee objectives and competencies. In summary the triggers for some of the most radical innovation that took place at Danone where “health” and “sustainability”, which resulted in an innovation of the business model of the company that focuses on “Health & nutrition as the core of the strategy”. As we mentioned before, Danone started to re-structure the organization as early as 2000. However, it was since 2007 that Danone radically repositioned to align core business with the renewed mission of bringing health through food to as many people as possible around the world. This strategy needed to be backed up by the entire organization and a series of changes needed to happen. With new companies joining the Group, Baby and Medial nutrition, the new areas of focus as well as the company’s culture needed attention. Danone traditionally has a culture that allows decentralized initiatives to take place, local issues and needs inspire promoting innovation that. The headquarters in Paris also work intensively in promoting ways for different business units to communicate and exchange systematically. Therefore, innovations in the organizational structures were introduced to leverage on this culture of decentralization and innovation. One of the main actions was the creation of committees formed by people from different departments and units designed to generate innovation throughout the organization inspired in two central pillars: (1) sustainability; and (2) competitiveness. Different committees were created to work on nature, social innovation and technological innovation, coordinated by the newly appointed corporate position of Nature Vice President, and with working groups in different countries and units. These committees incorporated the most senior managers to show the organization the seriousness of its commitment, including country presidents, executive committee members and other C-level executives. In Danone, unlike many other large companies, the focus on People (what we like to call “Danoners”, but also local communities somehow impacted by the company) is very pronounced. Human Relations plays a major role at Danone in terms of both performance as well as strategy. Historically, in the 70’s, the first CEO Antoine Ribaud defended the idea that the company’s responsibility didn’t end at the gates of the factories, extending to the community around it, the Double Project explained before. In this regard for Danone “people” is the center, both from a business as well as from a sustainability approach. In fact Danone considers environmental issues as a critical trigger of social innovation activities, because the main concern of Danone is how the environment affects people. The social orientation is so engraved and accepted at Danone, that there is the belief embedded in corporate culture that any manager aiming to become a senior executive, for example, will need to have a social experience, that is, to have worked with a social organization or a specific social program, to make sure he or she has that social vision in mind. Still, the new corporate division and Vice President position was called Nature, and this was not a small decision. The goal was to reflect a holistic approach on the relationship between the environment and people. The Nature VP position was occupied by a country manager, who originally had a marketing background , but a personal interest for sustainability issues, being in the company for many years. The sponsor of Nature was a very senior executive at DANONE, Group, occupying a global position. This manager has been a major drive for innovative thinking in Danone and his support allowed Nature to be established as a key aspect for the company’s innovative drive to deal with challenges ahead. So, although until that moment the majority of initiatives related to sustainability were still under human resources management, the creation of the Nature position and Committee initiated an internal shift. When Danone began to measure its carbon footprint, it was still uncertain which tool to use. A lot of research and a great deal of daring were needed to decide which direction to go. According to a senior manager “We spent more than a year testing and developing the measuring tool”. However, the question was never whether Danone should do it but rather what changes needed to be made to make it happen. In fact here we see a clear example of Danone’s culture of setting crazy goals that produce innovation, as in 2010 the Danone CEO made a public commitment to the community to reduce 30% of carbon footprint by January first 2012, when at that time the company had no idea of how this bold objective could be achieved. “However, everyone at Danone knows that when a clear public commitment is made, the team has to make it happen. So we worked really hard collaborating with different units to come up with an innovation that was a reliable tool that would deliver the promise our CEO had made” underlined the same manager. Formally, Innovation at Danone is part of R&D structures, having specific dedication to the subject. Therefore, in the new business model, R&D was responsible for the Innovation Committees, which exist at country business unit level and at a global level. At a global level projects are coordinated and prioritized. At a country level, each country unit proposes specific innovations designed for its specific context, or decides to bring to its domains what is internally referred to as “good practice”. These good practices are tested and implemented at a local or national level, and if successful these are then presented to the global committee, which decides whether to extend the innovation or “good practice” to a larger region, other countries, or even globally. The global committee prioritize different projects using the bottle neck approach, and the Committee follows the project’s steps (generation, selection, execution and implementation) giving it a “go or no-go” at each stage. Part of the committee’s work is to embed sustainable thinking and link its impact to projects as well as to evaluate the sustainability of the innovation process. As the Global Environmental and Milk Quality Director says, “pragmatism is always a main criteria for the committees”. This way of designing innovations or best practices, testing them and then turning success stories into corporate learning is called at Danone “from Lab to Land”. The idea is simply to experiment at a small scale, and than replicating and escalating successful projects or programs at country, regional or global levels. This process is a part of Danone’s DNA rooted in its culture of making innovation a central part of the business model. When a project in any area (social impact, technology, agriculture, quality, product, etc) has a successful story, with key learnings, and is developed or mature enough to be “rolled out” to other business units or countries, internal committees such as the innovation committees share the results amongst its members and assist each other on the implementation. Different committees communicate amongst its communities via intranet or the R&D network, so the R&D professional responsible in the country or region matches local opportunities with what is happening in another country or unit, and he or she can bring the successful project to his or her area. Between 2003 and 2008 in France, a “lab” project was developed to reduce methane emissions, which was called LINUS. Initially it was based on feeding the cows with flaxseed and that proved to reduce significantly the cows’ methane emission, and therefore the company’s CO2 emission. But the initial idea not only had environmental impact, but also an improvement on the milk’s nutritional quality. The feed was later improved with different types of nutritious elements and the quality of the milk generated a product that fulfilled many potential consumer wants and expectations in terms of nutrition and sustainability. The project was very successful and in 2010 other countries such as the US (Stonyfield Farm), and further Belgium and Germany, decided to implement it as well, thus turning the original small French “Lab” into an international “Land”. An interesting innovation on the packaging area was created by another initial “Lab” project called “Pick up Out”. Pushed by the need to reduce environmental impact and CO2 emissions, Danone decided to remove the wrapping paper around its yogurts. The gain in CO2 reduction was very important, as well as the reduction in cost. But the impact on sales, according to market research and several tests, was terrible, as consumers saw that not as a reduction in environmental impact, but rather as a reduction in quality. Furthermore, without the paper, Danone lost visibility in the lining at the stores, which combined generated a significant reduction in sales. Initially conducted on small scale, the “pick up out” project forced the company to re-think it’s packaging and completely redesign it. This generated innovations that turned this project into a very successful “Lab”, with actual gain in market share and significant cost and environmental impact reduction. The project was then extended worldwide “Land”. On the logistic area, another “Lab” called “Co-distribution” ended up generating a great impact company wide. The idea was simple, pushed by the need to reduce CO2 emissions and costs, and consisted on distributing Danone products together with various other products to the same clients. It started in the UK with a partnership with ARLA, a large retailer. Once the project was implemented and all the key learnings ready to share, it was extended to many other countries and companies, such as Romania and Southern Europe, including companies like Ferrero Rocher, for example, thus becoming another successful “Land”. Such innovations, following very similar processes, can be found in any areas or units of Danone, such as products, technologies, social issues, environmental issues, marketing plans, management processes and even business models. When there is an interesting initiative or project, it quickly receives attention form one of the transversal committees, then it is tested, and once it is seen that there is potential, with the Group’s support the company explores the possibility to extend it to other units. It is important to underline that “Labs” are not designed to develop solely or even mainly radical innovation. In fact, the Danone “from lab to land” approach is built more on developing incremental innovations, understanding that in order to stay in blue waters the company must be constantly innovating, as radical innovations will by definition be more rare and dramatic, while incremental innovations can be more easily absorbed by the organization and its customers. 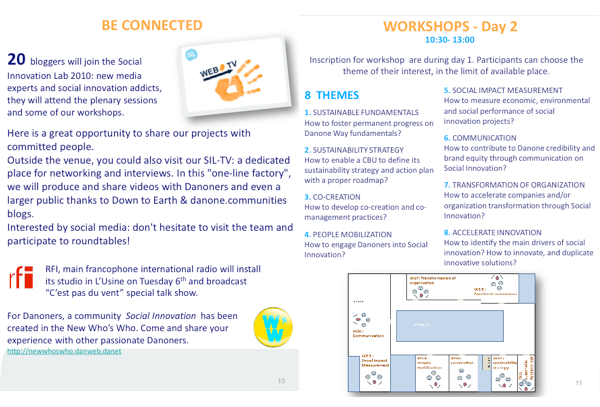 One clear example of the Danone “Labs· is the Social Innovation Lab, an event that brings together individuals from all companies belonging to Danone, in order to share stories, discuss success and challenges related to social and environmental projects from each business unit, exchange ideas, promote debate and listen to provocative perspectives. The event lasts for a few days in Paris and has fostered a large community of peers that although coming from different backgrounds and experiences, share the common belief that social innovation is at the heart of the long term strategy of the company, fostering inspiring conversations that fuel hard work and interesting innovations throughout the organization. For example, the “Lab” held in 2010 in Paris included a real time online discussion with many guest bloggers and activists about issues related to sustainability. The discussion was transmitted online to all Danoners and the open blog, and brought up attention to several issues such as trust and reputation. We had to hear some harsh comments and opinions about our business, but we also learned a lot about how to interact with stakeholders that not necessarily agree with what and how we do things. All this was promoted by the Group and experienced by the professionals that visited the “Lab”. In order to try and select, filter or aggregate the myriad projects, mainly the social ones, which the company has somehow supported over the years, a new criterion for project evaluation was created. Danone introduced the idea of “the triple win” to change the way success is measured. It has instituted policies so that when executives look at new projects they not only study the traditional financial indicators, but also what is called the triple win, which means the project must generate economic value in the short and medium term, it must benefit the environment (or communities), and it must be good for employees. This third part on generating a win for employees is about projects generating learning, development and motivation for workers – about employees opening their minds and learning new competencies that will ultimately benefit the organization. In other words, the triple win is about generating competitiveness value for the company, generating value for society, and generating value for the people directly involved in the project. Many of the social projects that Danone historically supported lacked one of the three aspects of the triple win. Either the project was simple financial donation, or it was an employee initiative not related to the business strategy, or it was a marketing scheme without a clear or significant social impact. Therefore, under this new triple win scheme, many of these projects had to be reviewed. Some were deactivated and the ones that were meaningful to the company had to be adjusted. In Spain, for example, there were two social projects that needed to be readdressed. One related to a major financial donation to the local Children’s hospital that most Danoners were not even aware. From a business perspective it was important to maintain the support and work together with the medical community on issues related to children’s obesity and malnutrition. It was needed to address the internal aspect, involving employees and the community. So, as a result an innovation was developed by the implementation of a program of Storytelling for children, where employees would visit the hospital weekly, interact with the team of volunteers and feel proud and connected to Danone’s initiative. Storytellers and drama teachers trained employees, a library was build at the company, and a group of volunteers was established. The same issue came across with another important social project to support children from underserved areas in Spain. In this case the innovation consisted of rethinking an existing program involving 17 after-school schemes for children between 6 and 12 years old, where they receive academic and social support through sports, play and health matters. The employees where not aware and the project, although very successful, had no impact internally and very little impact on the company’s reputation. Creating awareness and the possibility for interaction was key for the project to contemplate the triple win approach. The transformation took an entire year but established these projects as successful under this new parameter of generating a triple win for the company, society and Danoners. Aside from forcing behavioral change in senior executives, this measure also serves as a symbolic message to all managers and want-to-be-managers that sustainability at Danone is as important as achieving business goals and personal performance. 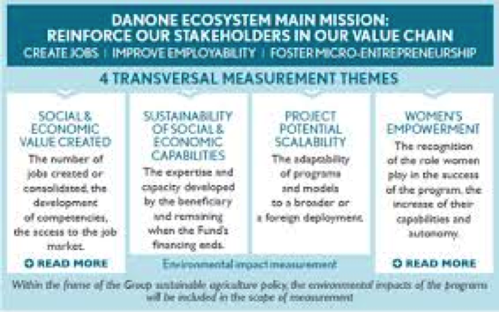 Also it aligns the reward and measurement system with the triple win approach, in that Danone must consider activities based on three equally important indicators: the organization, the individual and society. Danone developed tools to aid in setting objectives. For example, all subsidiaries use a common tool developed internally by Danone, called Danone Way, to define social and environmental objectives, which are then ratified by the Group. Once the objective has been ratified for the group it becomes an objective for the affected executives of the subsidiary. One example of an objective developed by a subsidiary is “the implementation of a carbon impact calculator for all stages of the value chain” explains a Carbon Master. Human rights: the goal is to ensure trust wherever Danone operates through controlling basic issues such as forced labor, diversity and safety. Human relations: the goal is to build a solid base to achieve business success and social project (the double project) through issues such as social dialogue, working time, benefits and personal development). Environment: the goal is to reduce the footprint in operations, including the supply chain, through issues such as environmental risk management, raw materials, or packaging. Customers: the goal is to be in tune with consumer’s needs, through issues such as quality control, nutrition or health. Governance & relations with external partners: the goal is to provide a clear reference system that established a framework on how Danone conducts business, through issues such as business conduct policies, suppliers and local communities. The Danone Way Fundamentals are not goals, but rather minimum standards. Thus, for each of the issues there are different levels of fulfillment, from level 1, which is the minimum required, to level 4, which is the most advanced. In the system, points are assigned for each level (0 for level 1, 10 for level 2, 20 for level 3, and 40 for level 40). Each subsidiary of the Group is rated according to a star system (similar to hotels) and then given an overall rating benchmarked against other subsidiaries of the group of similar characteristics. This way Danone intends to generate internal transparency, while at the same time fostering healthy competition among subsidiaries in the area of sustainability. The entire process is audited externally by KPMG. Regarding the specific area of environmental impacts, in 2008 the Danone group identified the five areas where its environmental impact is most significant as climate risk, packaging, water, agriculture and biodiversity, and developed policies and objectives for each of these priorities. Danone chose CO2 as a synthetic indicator, which aggregates a large amount of environmental indicators. Therefore, each of the strategic priorities has to have a translation in terms of reducing CO2 emissions. Danone considers sustainability as a central attribute of its entire product offering rather than a characteristic of a specific line. Not all products have the same sustainability criteria, but they all fulfill a minimum set of standards defined by the company. As an indication of its ambition, Danone has committed to the goal of making five of its top brands carbon neutral by 2012. Danone has eliminated some packaging and distribution systems. Additionally, the company has realized that 70% of the impact of its products comes from raw materials and other suppliers, not from its factories. This means working up and down the supply chain to implement long-term sustainability in the product area. Danone evaluates suppliers on sustainability issues and is part of the SEDEX platform, a joint effort to evaluate suppliers shared by many other multinationals. Danone challenges itself by defining big goals, which inspire people to generate innovation. The idea is to “put ourselves in situations that force people to think about everything upside down” summarized a manager. The experience with a dairy factory in Bangladesh is illustrative: “We said that we could not get cold milk. That forced us to think what are we going to do? Then we thought we will first pasteurize and then work the milk differently than we usually do. Then we said, we could not have consistent energy. That forced us to think again what we were going to do? Then we thought we will produce biogas with the cows and see how we can use that, etc,” continues the manager. An example of a big goal at Danone is the project to make all Actimel bottles from sugar cane: if accomplished, this would reduce the company’s CO2 emissions significantly. Internally, Danone is designing innovation teams formed by diverse members from different units and backgrounds to think “outside the box.” It is moving away from having R&D functions that are very closed, to having more kind of floating people who are managing networks across countries and business units. The goal is to generate working teams that almost organically become creative and innovative. The company has also put in place a “lean organization” program directed at reducing hierarchy and empowering employees, with the objective of increasing productivity, creativity and engagement. There is no implementation manual: an idea will go out and the company allows each business unit, factory, and department, to implement an idea that goes out in its own way, according to its possibilities. Subsidiary initiatives have gone ahead without approval from headquarters, such as a move to an ongoing food products donation and awareness program with a food bank in Spain. Sustainability and innovation are not tasks or policies that workers must implement, but rather values that they must believe in and that each worker has to translate into a way of thinking about his or her job. Sustainability policies are defined as a set of “fronts” or general goals on which the company must advance, not a list of actions. These fronts are understood as clear goals that people must integrate into their day to day which forces them to be creative and think globally in order to anticipate market and societal expectations. In most instances sustainability driven innovations that were developed at Danone did not start from a set investment on R&D and the projects did not have initial budgets. Instead, when people feel they have an idea for which they can justify the need, and show the numbers and why it is valuable and will create longer-term value for the company, the door is open to listen to that, and the resources follow. In Spain, for example, the Sustainability Committee holds regular meetings where these ideas, projects and initiatives can be presented. The Committee is composed by senior management and some experts on specific issues, and helps new ideas by pointing out to weaknesses and strengths, and possible solutions to improve them. It has created an open environment for new leaders and talents to present their ideas and receive feedback from seniors and experts that otherwise would not come across their ideas. Still, sustainability committees throughout the company have their own formula and composition, allowing different ways of working that suit each business unit. Some units have committees and other don’t, it is an internal choice. Danone has also broadened the scope and the vision of its innovation process to allow for small but often radical innovations to be developed around the world. The company has a formal R&D unit, but also has a lot of projects, many of them with external partners, to develop innovation projects. It is working more and more with an external network to develop sustainability driven innovation, and is engaging in new ways of working through partnerships, joint ventures, collaborations, stakeholder engagement and dialogue. This has prompted the company to question its notion of whom its stakeholders are. They are “not the big companies that sell the machinery. Then, whom should we talk to? We must talk to veterinarians, people from the village, local suppliers, and so forth. And once you accept this, it changes everything. Then your stakeholders and the resources you need to mobilize or to start the Project are different,” explains a senior manager. This has also meant that the company looks for other resources, such as public funding or finding synergies with business partners or clients. Danone uses social platforms and technologies to communicate with its wide network of stakeholders. “We manage a network, blogs and a global Facebook to give people around us the opportunity to grow at the same rhythm as us, because if they don’t grow we are limiting our own growth potential” continues the manager The overall objective of the tools being used to measure and manage innovation motivated by the search of sustainability is to “check that we are being innovative, and also check from a sustainability perspective. We have to make sure we are going the right way. In France, Danone has created a blog called Down to Earth, now a global tool. The blog invited activists, sustainability bloggers and personalities alike to interact and even challenge our environmental and social projects. Another very important social platform was the Danone Ecosystem Fund, created in 2009. Its goal is to strengthen our ecosystem, from an economic and social perspective. “Our ecosystem is constituted of all the little companies and people who work with and for Danone everyday,” says the VP of Human Relations. “From farmers to truck drivers and micro-distributors, there are many people who work outside of Danone, but close to the company. If we have a strong ecosystem, it means that we have strong roots to grow from. We are interdependent with these actors.” Hence the mission of Ecosystem: funding projects that consolidate the economic environment of Danone. As of today, the fund helps 40 projects in 20 countries, and is primarily a donation to financially (although other kind of support such as technical, technological or human resources can be given) help NGOs or local suppliers to take off a project. Perhaps the most valuable contribution of these social platforms and initiatives is the possibility to innovate in areas where the company may not fully understand or have experienced before. Unique knowledge and experiences open new possibilities for employees to bring different perspectives to the business. The main challenges Danone has faced in regards to implementing this strategic shift toward sustainability driven innovation has been to: (1) bring top management on board; (2) reconcile short and long term objectives and results; (3) develop tools to implement and measure accurately the new policies and actions; and (4) develop reporting and communications schemes. It must be noted that these four challenges are often generated when an innovation is implemented, because often it collides with the daily pressures and responsibilities of different company executives, requires short term investments and resources while long term results are uncertain, there are little tools to work with, and there is no clear communication coherent message. In this regard the challenges, although significant, are not considered to be that significant. In this regard the drivers behind this policies are conviction, intuition and resolve from the organization. As soon as the Nature VP was created, one of the major challenges was to bring on board many of the top leaders within the organization. At the time, a challenge was set by the CEO but the “how to” was still to be defined. At the Group headquarters there was a lot of work happening to try and engage these leaders in this challenge, to create empathy and offer support for the hurdles ahead. As explained before, at Danone each unit is responsible for finding its own way to deliver the results. Then, at a senior management meeting held in Evian, the idea of Ambassadors was brought up. The Nature VP needed a strategy for embarking these managers and getting them behind the initiative. The Nature team prepared a surprise to its leaders. A short movie was produced interviewing the children of these managers, asking them what they thought about environmental responsibility Danone had. The parents didn’t know what their children were going to say, but the result was very touching and reflected the vision the company wanted to portrait in a candid and genuine way. It was as if the kids were telling their parents what they should be doing for the planet Also, although as we mentioned before establishing a part of their bonus on the basis of sustainability performance was helpful, there was the sense that although important, sustainability was not at the same level of the other two aspects. In other words, there was the sensation that one could be fired for failing to achieve certain organizational or individual performance indicators, but not based on sustainability performance. This gave the feeling of different levels of status, which generated a challenge. Focusing on sustainability and innovation means accepting that sometimes a project can be valuable in the long term, but generates losses in the short and even middle term. Danone encountered this when it decided to innovate by eliminating packaging on its 4-pack yoghurts, the “Pick up out” lab described above. It carried out a pilot project in some French supermarkets, and the response from consumers was quite negative, as they did not perceive it as a sustainability policy but rather felt that Danone was reducing the quality of the product. Despite this, the company decided to proceed with the progressive elimination of this packaging. The sense is that in the end this policy will not have a negative impact, perhaps thanks to a better marketing campaign or raising awareness. The rationale was that: “if we don’t do it we will start to face external criticism, and one day some governments will start passing some tougher regulations on packaging and waste, and we are leaders so we have to do it first. Then we say, let’s do it, and if we lose money then we lose money,” explained a senior manager. Sometimes the market is not ready for the innovations undergone by Danone. For sustainability to become truly strategic it must go “from being a cost centre to a profit centre,” continues the manager, which may require, among other things, that sustainability specialists become more involved in the commercialization side of it as well, in order to give the innovation the best chance to succeed. At the company there is a constant conversation going on about the innovations that some units may embrace and that it may not be appropriate for another. Because Danone is a multinational company and deals with different products for different societies, in many occasions what is a great innovation for one unit is not the same for another. A problem Danone encountered, as a pioneer in innovation driven by sustainability is that there were few tools available to evaluate, measure and manage the activities being developed. It had to be innovative in developing technical tools to manage sustainability activities, or to change existing tools. For example, to measure basic sustainability performance Danone developed the aforementioned tool called Danone Way Fundamentals, which is a measurement tool that evaluates how each country’s subsidiary of Danone is doing in terms of the minimum requirements defined by the group. The tool does not give a best practices benchmark but rather it defines minimum compliance requirements, thereby functioning as a risk management tool. Danone invests a lot of time and resources into developing specific tools in order to measure, evaluate and verify sustainability activities. Danone has “measured everything, we spent the better part of 2008 measuring, and now we can tell you how much CO2, water and other impacts we have for each gram of yoghurt or other products we produce” said a Carbon Master Manager. These measurements are not solely developed for verification purposes but are also a fundamental part of the company’s understanding of sustainability as a strategic issue. For example, Danone has been trying to integrate impact measurements into its SAP system, with the idea that impact will be automatically measured throughout Danone. The reason for this is its understanding “that just as now all food products must include ingredients and nutrition in the labeling, we believe that very soon they will also have to include footprint, and we want to be ready for that” continues the Carbon Master. Clients are becoming more demanding when it comes to sustainability: just saying you’re sustainable is not enough, you have to provide metrics. Being transparent and precise about sustainability performance is a legitimacy issue: “Group Danone has committed publicly, we have boasted about it, and we have defined it as a central company objective, and our president has said that we would do that. The president doesn’t want to look bad,” Says a senior manager. Sometimes it is difficult to come up with percentages on the recycled content of products, but despite the difficulty of measuring the company has to do it, as stakeholders demand it. At Danone, embedding sustainability thinking into business decisions has been a long but steady journey. The company has learned that sometimes it is more important to tell the story of how progress is being made rather than actually presenting a final result that may or may not be valued by the consumer. Mostly there is a common understanding that reputation comes from a mix of different stakeholders that hold the company in different positions. What may be key for government or media may not be equally important to consumers or scientific community. So changes or incremental innovation must be communicated differently to different stakeholders. There is a mix of pride and humbleness, it brings the company close to its suppliers and partners to such an extent that talking about difficulties with them is not an issue. It is the learning and the progress that improve relationships with these stakeholders. The blog and websites the company provides are packed with these examples, with leaders telling compelling stories about the path, the challenges and the dreams surrounding sustainability at Danone. The positive impact of innovation strategy driven by sustainability has multiple facets, such as being good for the reputation of the company and reducing costs dramatically. Not just that, but also reinforcing the focus on the mission and the reputation as leader, advance future regulation, improve efficiency (eco-efficiency) with more competitive products (better price/quality ratio) and finally better integrate the business units in the Group. Finally, some metrics, already described to be highlighted are the Triple Win, the Carbon Footprint tool and Danone Way Fundamentals. Here we outline a couple of the benefits that accrued to the organization. In pursuing innovation, Danone has learned by doing. Projects have generated unexpected opportunities and have transformed the organization and the way it looks at things. A senior manager said: for instance, the Bangladesh project (a collaboration between Grameen Bank and Danone) allowed Danone “to learn a lot about our capacity and our skills to build a factory under different conditions. If we had never done this project today we would have a different vision about the way to manage an industrial tool of this type. So this sort of innovation comes from what we learn from unexpected places, both within and outside the company, for example from small veterinaries or people from a village.” Danone industrialists were not prepared to set up a factory in the conditions initially encountered in Bogra, with uncertain energy flow, poor infrastructures, and difficulties to control quality, transportation problems, water, veterinaries, and so forth. They “had to come up with a an innovative way to develop a yoghurt factory that resulted in our industrialists developing innovations that later on have resulted in improvements in the production process in other Group factories.” In this way the innovation project, regardless of the social benefits for the people in Bangladesh, generated a great value for Danone in terms of knowledge and technological innovation. Sustainability driven innovation has worked as a way to engage the Danone workforce not only with sustainability projects, but with the company itself. Sustainability is a motivator for workers, which can help generate an intrapreneurial atmosphere where people feel responsible and empowered to integrate sustainability in their daily activities. In some cases sustainability was a factor in people’s taking the job for interviewees; in this way it draws new types of talent not available to other companies. Danone has experienced how sustainability can be a powerful driver of innovation as it sets big, and sometimes contradictory, goals that push people to think in new ways and face challenges. It has functioned as a learning experience and a motivator for employees, and has brought the company closer to an external network of shareholders with whom the solutions for the future jointly lie. The Danone experience has also shown how sustainability driven innovation can be core competitiveness attributes for a company. A culture for innovation with clear and shared values around sustainability is central to have a clear vision and mission at Danone. Values are known transversally and lived by employees and stakeholders on a daily basis and the company tries permanently to offer mechanisms for recognition and promoting innovative thinking. Big goals: Competitiveness is a result of visionary thinking associated with flexibility of action. Launching big goals and eliminating constrains by allowing decentralized decision making on “how to” has proved a successful formula that forces the organization to be competitive through innovation. Visions, values and strategies need appropriate organizational assets to be developed and embedded throughout the organization. This requires an adequate organizational structure and a corresponding business model and value proposition, so that the strategy is aligned and coherent. Open innovation: By working with extended internal (cross functional and between different business units) and external (suppliers, communities, consumers, etc) networks Danone has been able to develop solutions and found opportunities that would have never been developed solely from a classical linear R&D culture. Furthermore, interacting with stakeholders has exponentially enriched Danone’s role and also its reputation. Talent: as Danone becomes known as a great place to work, and its culture of sustainability and innovation becomes know through word of mouth, talented people who share Danone’s values and vision tend to want to work for us, thus attracting more talent. Innovation calls innovation: our experience shows that having a reputation of being a company that has such a culture, produces some unexpected benefits such as a “call effect”, where many companies or individuals who have creative ideas usually prefer to discuss them first at a company such as Danone than at other companies that do not sure such a culture. Commitment: Involvement and support from top management is a “si ne qua non” condition for Danone’s growth and success. Specific measurement tools have enabled Danone to confidently assess its performance, setting goals that are realistic to the Group but individually challenging to each unit. Employee empowerment is key for achieving innovation driven by sustainability. Likewise, recognition is the fuel to keep it alive and thriving. Danone has a predisposition to take risks that seems to engage its workers to a very high level of motivation and excitement. Finally, but equally important, being humble to learn has proven to be an important quality that allows to ask ourselves questions, and not to let our own success become a problem. The most important lesson learned is that developing a culture of innovation and sustainability is a very powerful source of competitive advantage, because these are very complex to embed in the organization, and therefore almost impossible to replicate. Several quotes were extracted from the series of interviews generated for the original publication, so there is a mix of personal statements from different employees and the narration from the authors of this paper. This paper reflects the personal perspective of the authors and not necessarily of Danone Group. The authors would like to specially thank the Danoners that have contributed to this paper: Jordi Constans, Michelle Boadas, Franck Aime, Myriam Cohen-Welgryn and Didier Moreau. Love the VP of Nature wording and innovative positioning. Of course I knew about the Danone Way because of the buzz and some exchanges between our companies but it is a big plus to get access to this complete tour.With a special mention to the 123 pages attached doc....not much pictures help into it (seems an internal signature for serious communications?) but fresh and delicious plain material....(product DNA?). Thank you for all efforts and sharing. am great a fun of Danone.How can someone in Zambia (where you do not have offices) partner with Danone.My group and I are also take part in a competition on Sustainability on Ashoka website. This seems a really important story to understanding the relationship between open structure, culture and real progress towards sustainable ways of working. There is something there in giving people ownership and responsibility, first for self, for innovation and ultimately for planet. I'm doing quite a bit in this area, do let me know if interested in sharing stories. Congratulations and than you for sharing. In order to attain competitiveness when it comes to transportation system, they need to re-evaluate their processes and check the problems and find a good solution for it. Well, emissions is harmful to the environment so it needs to be reduced. In order to do that they need to change their system and improve the processes in order the reduce the energy consumption with regards to transportation. This will increase their sustainability for sure. Learn more about transportation here BR International Freight Transport Melbourne Provider.